Community Welcomes Planet Aid Donation Center During Ribbon Cutting Ceremony - Planet Aid, Inc.
Local residents, Planet Aid staff, and members of the Newport County Chamber of Commerce attended a ribbon-cutting ceremony on July 22 in celebration of the Planet Aid Donation Center’s successful first month. Rhode Island Congressman Jim Langevin congratulated Planet Aid on Twitter. The Donation Center provides locals a 24/7 drop-off point for their unwanted clothes, shoes, accessories, household textiles, appliances, glassware, books, sports equipment, and more. Collected materials are repurposed or resold, with proceeds being used to fund development projects in Africa, Asia, and South America. The Center has averaged more than a ton of donations per day during its first few weeks of operation. A light lunch and refreshments were served at the event. 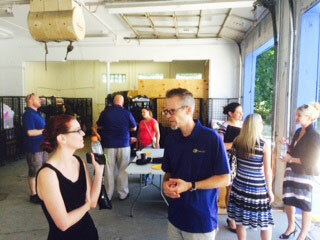 Recycling advocates from the area were in attendance, including Maureen McManus from Newport’s Clean City Program and Kristin Littlefield from Rhode Island Resource Recovery Corporation. The Planet Aid Donation Center is located on 533 Broadway in Newport, Rhode Island, serving residents of Aquidneck Island and the surrounding communities of Bristol, Jamestown, Narragansett, North Kingstown, and Tiverton.